Did you meet your soon-to-be spouse online? Did you strike up a rapport over Facebook? Perhaps you’re both known for being somewhat addicted to the popular social networking site and you’re looking for something a little bit quirky and, shall we say, less conventional to invite your guests to your upcoming wedding? If this is the case, you’ve certainly come to the right place! The Timeline wedding invitation from Blush Stationery has been designed in homage and celebration of the famous Facebook Timeline! In the run up to your big day you will be assigned your very own Timeline, a place to showcase your favourite photographs and of course the all important wedding day details. The notable ‘Like’ button has been replaced with a ‘Love’ button and even the little search box at the top of the ‘page’ is filled with the Bride and Groom’s names! Complete with a profile and cover picture, the Timeline invitation couldn’t be any more authentic. 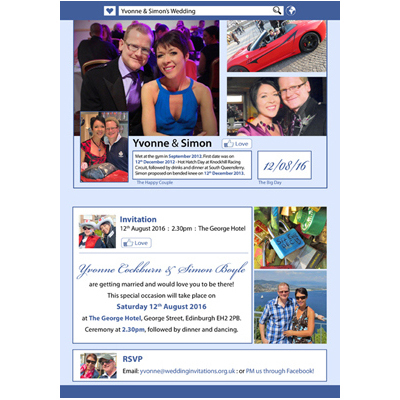 Below this your guests will find the date and venue details of your wedding in the style of a Facebook ‘Event’. This is followed by your RSVP details; choose your home or email address, wedding website or even your very own Facebook wedding group/page. *Grandma Joyce and Aunt Mildred might not be too impressed, however! Tags: Facebook, Personalised, Photographic, Social Network.